Lights Out San Francisco started in 2007 as citywide energy conservation and awareness campaign that culminated in a public event held on the night of October 20th. Citizens and the city of San Francisco were encouraged to turn out all non-essential lighting for one hour. As the movement grew in San Francisco other state and nation-wide cities formed sister organizations and on the 20th, several cities joined with San Francisco to turn out the lights. Lights Out is now embarking on phase two - a new energy awareness campaign focused on downtown San Francisco commercial buildings. Phase two encourages downtown buildings to turn out their non-essential lights and appliances every night making San Francisco the first dark skyline in the country. Again, Lights Out San Francisco was a huge success, thanks to all of you! We’d also like to extend a special thank you to the photographers who took some amazing before and after photos for us. 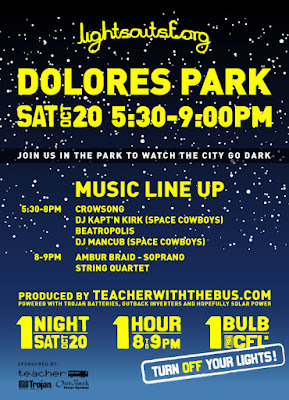 If you liked what you saw in Dolores Park last Saturday, check out what else Teacher with the Bus has to offer. Building off of all the positive responses we’ve received from folks across the country and even around the world, we’re moving forward with Lights Out America. Please join us in taking it to the next level by participating in Lights Out America on March 29th, 2008! A big thanks to all who participated in Lights Out last night! We are especially grateful to Jens-Peter Jungclaussen the Teacher With The Bus and all of our volunteers who made the event a great success. We had a good time in Dolores Park, and we hope that you had some fun in the dark too. Yet another signal of support from our fearless leader in Sacramento. Governor Schwarzenegger shares his support for Lights Out San Francisco. He calls it an “illuminating” event! “Climate change presents a challenge to the survival of our planet. While there is an urgent need for decisive action to address climate change and greenhouse gas reduction nationally and globally, we must act locally as well. “Solutions to the climate crisis must be as local as our neighborhoods and as global as the planet. By taking part in Lights Out San Francisco, each resident will be taking a positive step towards reducing green house gases emissions on a local level. Our good friends at Craigslist posted a link from their homepages in San Francisco and LA. Thanks guys…this will definitely help raise awareness of our event and save energy. A big thanks to Raymond, Ryan and their friends at Holy Name School! They helped us pass out CFLs and information about LOSF at their elementary school. You guys have been a great help! Evidence of global warming is made quite apparent by the disappearance of ice in the Arctic. Today, the New York Times ran an article demonstrating these effects: “New Coast Guard Task in Arctic’s Warming Seas.